Where are good swimming pools or swimming parks with malls in Bangkok. I visited in the past The Mall in Korat. This Mall had a big swimming park with attractions and pools. Where can I find this kind of swimming parks with shopping Malls in Bangkok. 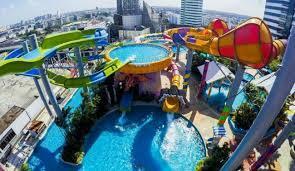 Yes, I have been with our children in Dream World and in Siam Park City in Bangkok. I am looking for something new or different to keep our kids busy. We will also try to visit some palaces and museums and temples. But we don't know where the good swimming pools are. anybody knows where we can go with the kids in Bangkok to give them a good afternoon? Central Bang Na (renamed CentralPlaza Bang Na) has a water park at the top. ...and some random pics to clean up the thread. Last edited by Bogon; 24-03-2017 at 07:49 AM. but expensive.just had a quick look at the prices. 4 persons, so only for the entrance already 1600 Baht. If you can find anyone to book it with an SCB credit card, then you can get 50% off. From today - 4th April 2017, Pororo's Playground Pool will be under constuction for a new watertoy installation. We are apologize for the inconvenience and please accept our 20% discount for your courtesy in visiting Pororo Aquapark. Last edited by Bogon; 24-03-2017 at 01:52 PM. i live about ten minutes away from it. how did i not know this existed!? 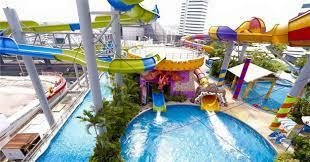 The Mall Bangkapi has a big waterpark on the top floor. Not expensive. Nicely maintained. Suan Siam.....in Minburi, easy to get to from the expressway. They serve booze up there too. This makes me suspicious that you didn't know it existed. The Mall Ngamwongwan has one too if you live that side of town. As mentioned by Humbert, they have one at the Mall Bang Kapi. It is the same as the one at the Mall Korat that you visited (about 100 baht a person), and they also have another one at the Mall Bang Khae. I think they are all named the same, so Google "Fantasia Lagoon" and you should be good to go. scientists calculated that one 220,000-gallon, commercial-size swimming pool contained almost 20 gallons of urine. and that was in canadian pools. god only knows how much is in a thai pool. ^That should be a strong selling point for Earl. a bit of urine never killed anyone. I have to say that when we visited the Mall in Korat, the water park was very clean. We even had to get out of the pool during the day. They told us that they did an extra daily cleaning when there were a lot of customers. but again, thanks for the help. A Thai municipal swimming pool full of Asians? That should be a strong selling point for Earl.